Little Monkey Apps MAB Addition builds on the previous introductory App, Little Monkey Apps MAB. 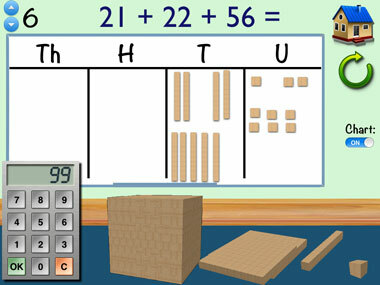 The App compliments the use of hands on experiences for modelling addition problems using MAB blocks in instances when using real blocks is not practical. Physical trading is paramount in understanding how to complete written addition problems. 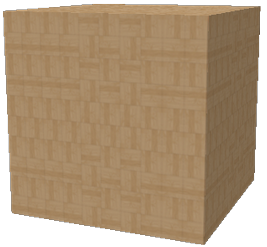 This module asks students to recognise that numbers can be represented in many ways using MAB blocks. For example 52 might be five tens and two units, or could be 4 tens and 12 units. 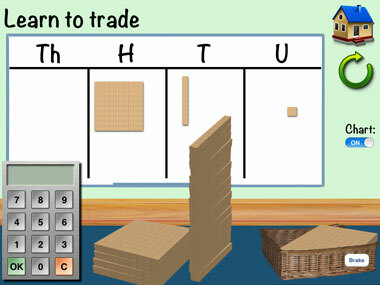 In order to complete addition tasks, students need to have experience in trading ten units for tens, ten tens for one hundred etc. Blocks are set out on the floor, to be placed on the place value chart, when 'ten' has been placed, this needs to be traded. Students use the basket to trade or regroup where appropriate then type the answer in on the keypad. Use the MAB blocks to complete the addition problem, placing both numbers on the place value chart and then typing the answer on the keypad. Levels of difficulty can be changed the up and down arrow buttons. No regrouping required in this activity as a precursor to the following task. 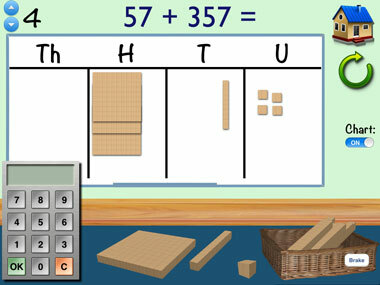 Use the MAB blocks to complete the addition problem, placing both numbers on the place value chart, use the basket to change blocks to represent the correct place value, then type the answer on the keypad. Levels of difficulty can be changed the up and down arrow buttons. Task appears similar to previous challenge but with regrouping in all levels. Regrouping up in units up to 30, i.e. Regrouping one trade in units or tens place up to 200, i.e. Regrouping to 999 one trade in tens place, i.e. Regrouping to 999 two trades, i.e. Regrouping to 9999 three trades, i.e. Regrouping, three addends two digit numbers, multiple regrouping either units or tens but not both, i.e. Regrouping, three addends two digit numbers, multiple regrouping both units and tens, i.e.